Huawei is pushing on its latest chip, the Kirin 970 with an artificial intelligence NPU. But how does this much talked about AI really work? The Chinese company wanted to show us by putting the Huawei Mate 10 Pro at the helm of a Porsche Panamera and launching it in a prepared path with unexpected obstacles. Artificial intelligence (AI) is one of the biggest revolutions in the information technology sector and will certainly change the way we interact with technology. Huawei has put a lot of emphasis on this new technological approach based on machine learning, so much so that it created a SoC with a unit dedicated to the processing of AI-related tasks. The biggest problem for Huawei is how to make users understand how this technology really works, how it can improve the use of smartphones in everyday life, but above all how it can improve over time with the use of devices. Quoting a representative of the Chinese company "we are often asked how it is possible to verify in a concrete way the functioning of this NPU". To answer these questions, Huawei created the demo in which we participated. 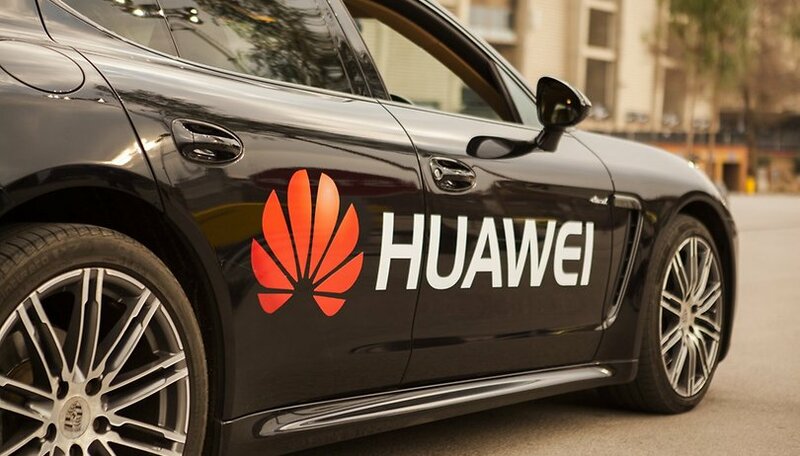 Huawei has therefore decided to equip a Porsche Panamera with the artificial intelligence of Huawei Mate 10 Pro to show how the machine vision can recognize images quickly and accurately, reacting accordingly. A DSLR placed on the roof to ensure a clear and precise view (the smartphone is located inside the car, which makes it difficult to use the integrated camera). A video system that can send images to the smartphone. A Huawei Mate 10 Pro, like the one that can be purchased in the shop, which has a dedicated application created using Tensor Flow that can take advantage of the NPU for image recognition. A Wi-Fi system for receiving commands from your smartphone. A hydraulic system for pedal pressure and steering to give the Huawei device full control. The car used was certainly not randomly chosen. The automotive brand collaborates with Huawei for some Porsche Design devices and the chosen model does not have any guidance system that may disturb or help the Mate 10 Pro in its task. But let's move on to the demo itself. The car "cruised" on a 100 meter-long route at 5 km/h, during which the Huawei Mate 10 Pro was shown some possible obstacles so that it could recognize them. The car was then brought back to the starting grid and the device showed us the various obstacles recognized by asking us what to do if they were on our way (the choices were: turn right, turn left and brake). We decided the reactions so we can confirm that it was not possible to prepare the car for certain operations. Once we made our choices, the employees chose an obstacle among those recognized by the car in order to add an additional random element to the scene: neither we nor the smartphone were aware in advance of the obstacle chosen. At this point the car was thrown at 50 km/h on the same route in the direction of the obstacle. It seems like a low speed but, believe me, from inside the car and on such a short route the demo didn't seem to be slow at all. The obstacle was a football ball and my colleague Steffen's action was to turn right. The action was performed flawlessly. The person in charge of the demo showed us how they only had three weeks (plus two weeks of brainstorming) to complete the project, and I have to admit that I was very impressed. In addition, we have also been told that with the Android 8.1 update, the Huawei Mate 10 will be able to take advantage of the new NNAPI as well as the company's proprietary APIs. This means that all apps created using these standard instructions in the latest Android version will run much faster thanks to HiSilicon's NPU. The system of the Huawei Mate 10 Pro has been trained with thousands of images of every possible object in the demo: football balls, bicycles and dogs. In practice, Huawei uses this demo to demonstrate how the Kirin 970's NPU is able to recognize the camera's signals and react quickly accordingly. In everyday use, this is used in the camera application: the system recognizes the scene, the main framed object and adjusts ISO settings, shutter speed, white balance, color saturation and much more for the best possible result. We certainly expect to see this technology further improved and evolved in the brand new Huawei P20 that will be presented in Paris on March 27th, and thanks to the use of three rear cameras in combination with advanced algorithms, AI will hopefully bring a further innovation in the world of computational photography for smartphones. That is at least what we expect! What do you think about AI in smartphones? Do you find it useful?